Make sure you read the full post as below my thoughts on our friendship, Katelijne also wrote some words ! When we were 15 we were in the same class in high school. But after a few months, Katelijne made the announcement that she would be leaving the school and Belgium as her parents decided to move to the other side of the world. Once she had moved to Australia, we started writing letters and our friendship continued ever since. I must say it even grew over the years ! Growing up, we let eachother in on all our secrets and adventures, but also our dull moments and the problems we had. Once I was married, I phoned Katelijne for the first time and it was so strange but yet so familiar to hear her voice ! We phoned eachother from time to time and kept on writing letters. We sent presents too at birthdays or Christmas. 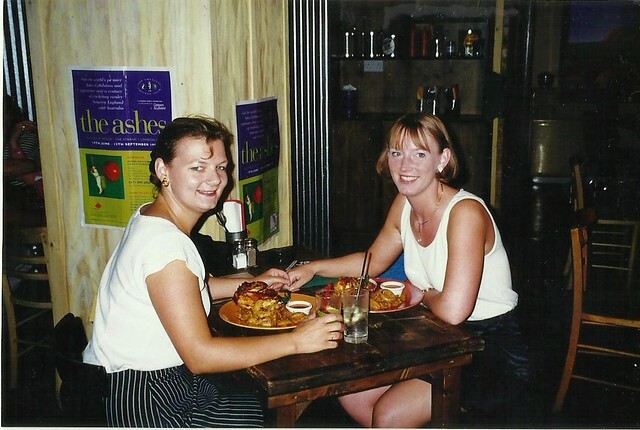 In 1997, 10 years after moving, Katelijne came to Europe for several weeks. She travelled around Italy but when in Belgium she stayed at our place. We had so much fun together ! Having late night chats (and snacks… and drinks ! ), going on day trips and even going to London for a couple of days. Though it had been 10 years since we had seen eachother, it felt so good, so familiar… just like a good friendship should be ! A couple of years later, in 2002 and also in 2004, Katelijne visited us again. This time she was staying elsewhere since our guest rooms were taken up by our children. But we still did a lot of trips together, building some more memories. Now I haven’t had the opportunity of visiting Katelijne in Australia yet. I would so much want to see her again. I’m not ruling out me visiting her one day ! It would be simply fantastic if she could show me her beautiful adopted country…(us two in a camper, cruising around Australia… we’d be laughing and having fun till the cows came home, I’m sure !). I love you Katelijne ! Distance and time may keep us apart, but our friendship will last a lifetime. Thank you for your friendship Kathleen, it means a great deal to me! I wish we lived closer (or were millionaires so we could fly over and see each other more regularly)….now about that skype account…when are you going to set that up??? This entry was posted in Personal, Quotes 'n thoughts and tagged Australia, friendship, quotes.